We tend to achieve our very best outcomes for our clients when we combine our service offerings into a suite of services within the context of a longer-term relationship that allows us to complete all phases of the Data-to-Action model. Each service suite is oriented to the scope or level at which are working within the client: individual, team, or organization. These suites of services are often layered, one on top of the other, across time within our client relationships, with work at the individual level naturally informing work at the team level, which easily builds to work at the organization-wide level. Click on the different parts of the interactive grid below to understand how the Data-to-Action model and the layering of the Service Suites fit together. Once a client need has been identified, the Data-to-Action model can be easily applied to any of the three broad level of initiatives on which we tend to work: the individual, a team, or and organization-wide endeavor. In order to server our client through the Data-to-Action model, we apply a number of different service offerings, create a Service Suite. The Service Suites are tailored to the specific situation and to the level at which we are working: individual, team, or organization. The different levels of Service Suites tend to build on each other. We often begin working with a client at the individual level, conducting Psychological Assessments, for example, and then moving through the Data-to-Action model in the individual Development Suite. Then, we may progress to a Teambuilding initiative, going through the phases in the Team Development Suite while, at the same time, pulling in information gathered from the work that has been done in the Individual Development Suite. This may then roll up to an organization level, where the work being done in the Team Development Suite evolves into a Culture Change initiative that moves through the Organization Development Suite, informed by data coming out of the work done in the Individual and Team Development Suites. When we are working at the organization or system level, the goal is organization development. 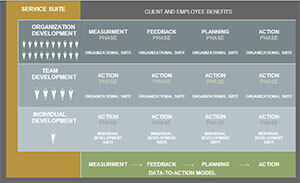 The suite of services we typically pull from to move through the Data-to-Action model at the organizational level includes those described in the phases shown horizontally to the right of this box. When we are working at the group or team level, the goal is team development. The suite of services we typically pull from to move through the Data-to-Action model at the team level includes those described in the phases shown horizontally to the right of this box. When we are working at the individual level, the goal is individual development. The suite of services we typically pull from to move through the Data-to-Action model at the individual level includes those described in the phases shown horizontally to right of this box. We begin by gathering as much information about the individual, from as many different perspectives, as we can. The Psychological Assessment focuses on determining the underlying personality make-up of the individual, while the 360o Feedback Survey provides an understanding of how that personality profile manifests itself behaviorally in the workplace. In addition, we may gather assessment information through interviews with the individual’s coworkers as well as through opportunities we have to directly observe the individual “in action”, on the job. In the feedback phase, our intent is to facilitate the process through which the individual is provided with as much feedback as possible, again from multiple perspectives, so that the individual has a crystal clear self-understanding, uncluttered with blind spots. We provide the individual with feedback from the Psychological Assessment and the 360o Feedback Survey, as well as from our own experiences with the individual. We also facilitate feedback conversations between the individual and the individual’s manager, coworkers, and direct reports. Once the individual, the consultant, and the individual’s manager have a clear understanding of the individual’s personality, internal motivators, behavioral style, and effectiveness, the next task is to establish the individual’s developmental goals. The individual must feel a high sense of commitment towards the goals that are chosen, which will include strengths the individual needs to further leverage and liabilities upon which the individual needs to improve, as well as potential derailers that need to be avoided. Each goal also needs a written action plan that specifies how the individual is going to work towards the goal. The writing of the action plan is one of the most difficult aspects of the development process and requires close collaboration between the individual, the consultant, and the individual’s boss. Once the goals and action plans have been written, the real development work for the individual begins. In follow-up sessions, the individual and consultant will discuss the progress the individual is making in working towards the goals. Thus, the action plan, with its goals, deadlines, and accountabilities clearly delineated, becomes the structure around which the individual’s developmental work is conducted. The overriding role of the consultant is to provide momentum to the development process and to bring action orientation to the individual’s development work. ….and then repeat the measurement phase. A very important part of the work to be done in putting a solid individual development process in place is the creation of the mechanisms in the environment around the individual that will encourage, support, and reinforce the individual’s growth and development. This work is done within the context of building a “feedback-rich environment” around the individual that helps ensure that the Data-to-Action model is completed by repetitively cycling back through the measurement and then the feedback phases. Besides personally serving as a measurement and feedback tool, the consultant helps the individual build in regular feedback opportunities with the individual’s boss, as well as looping key coworkers into the individual’s development process that can provide feedback to the individual on a regular basis around targeted developmental issues. In this way, the consultant helps the individual be very purposeful about building feedback mechanisms into the day-to-day work experience. Done correctly, these key feedback-givers become committed to providing the individual with “real-time”, in-the-moment feedback on a daily basis when opportunities for feedback and development naturally arise as everyone goes about their business. This process of helping the individual create a supportive, feedback-rich environment is critical to the long-tem success of maintaining the behavioral changes specified in the individual’s development plan. The process and the “no secrets” developmental culture that arises out of the process are hallmarks of our approach to Executive Coaching. After the individual has cycled through the Data-to-Action model a number of times, each time achieving higher levels of performance, it is the perfect time to do another 360o Feedback Survey. This re-survey helps to bring a more quantifiable, objective view to measuring the progress the individual is making against the development goals, as well as highlighted any new areas that may need to be incorporated into the individual’s development plan. The initial phase in the Data-to-Action model is the measurement stage in which information is gathered that will inform the subsequent action. Each of our consultants holds an advanced degree in psychology. Coming from a scientist – practitioner model, we are dedicated to the discipline of research in the applied arena: thoroughly gathering all relevant data and bringing it to bear on the issue at hand. The measurement methods we use to gather data vary according to the specific situation and the level at which the work is being done, and can include psychological assessment, personality instruments and cognitive measures, individual interviews, focus groups, process observation, surveys, and performance data. One of the defining hallmarks of our Data-to-Action model is the collaborative nature that must exist between the consultant and the client (i.e., the individual, team, or organization under study). The diagnostic data, gathered in Phase 1, are fed back to the client be the consultant, who then helps the client determine strengths and weaknesses of the client. The feedback is given in the spirit of being part of a joint discovery process where we partner with the client to develop a rich understanding of the client’s current state of affairs. Once we provide the client with all the relevant and useful data, we work with the client to analyze the data, looking for the most compelling patterns and trends, and determine ways to optimize the strengths and minimize the weaknesses. The collaborative nature of this joint diagnostic and planning process is a key ingredient in distinguishing out Data-to-Action model from the “doctor-patient” model in which a physician comes in and independently makes a diagnosis of the patient and prescribes a solution. We know our clients know their business better than anyone. The collaborative process, and the resulting relationship that develops between the consultant and the client, provides the context and shared frame of reference necessary to create buy-in and commitment on the part of the client for the action phase. At the end of the planning phase, the consultant and the client have agreed on what actions need to be taken, and have put appropriate goals in place. The action stage is where the hard work of implementing the plans developed in the previous stage takes place. This is the period of time when the client, with our assistance, takes steps to transition from the current state to the desired future state that has been conceptualized in the planning process. This is the step where we should see shifts in the behavior of the individual, team, or organization that will take the client to a higher level of performance. Then, back to square one….. The cyclical nature of the Data-to-Action model instructs us to move from Phase 4 back to Phase 1 where, through the measurement process, we can gather information after the action has been taken to assess the impact of the action and improvement in performance. This is naturally followed by another feedback process which flows into further diagnosis and planning, and to the revision and/or resetting of goals along with the resulting new action and ever increasing levels of development and performance.